The Botanic Gardens are an obvious favourite place to visit for anyone living in Sydney, being central, accessible, and generally fabulous. I am going to try and be specific about them, to divvy up the place into items/specimens/creatures and so on...after all, it is not somewhere you only visit once; why describe it just the once? 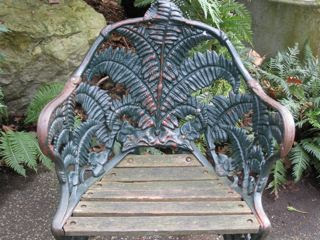 The Fernery is where I shall begin. Although insignificant on the outside and, to be honest, rather tatty on the inside, this conservatory contains an item of unsurpassed genius: an ironwork chair with a fern design. 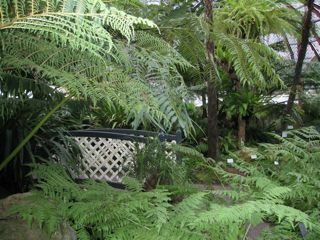 I don't know who designed it or when as the Botanic Gardens Trust website merely says that the current Fernery was created in the 1990's on a site where previous ferneries have been and that it is a good place to get wedding photos taken....extremely informative.